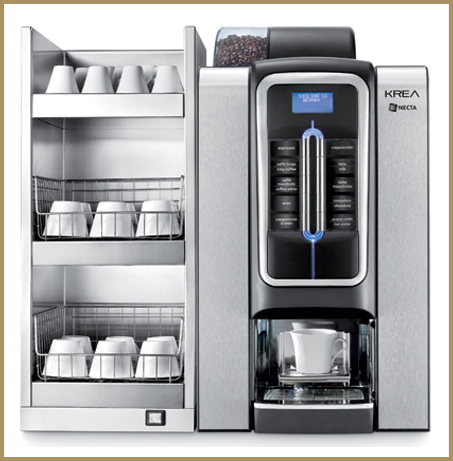 The Krea is a tried and trusted, exceptionally cost effective and easy use bean to cup coffee machine that is ideal for a low and medium usage locations. The machine uses a granulated milk to create the milk based coffees such as cappuccino and latte which makes it much easier to clean and maintain than systems that use fresh milk. The Krea also gives you the option of hot chocolate and mocha created from Suchard and Cadbury chocolate powder as well as a soluble coffee canister from which you can produce decaffeinated coffee options. The Krea needs to be plumbed into the mains water supply which allows the fitting of a commercial water filter in order to improve the quality of the drink and reduce issues that can occur because of lime-scale build up. Featured is a rinse cycle that is activated with just the touch of a button and doesn�t require any specialist cleaning products. This makes it much easier to live with on a day to day basis than a system that uses fresh milk. In addition making a drink couldn�t be simpler with just a touch of a button. This machine does offer you a hot water option however it should be stressed that it is not designed to produce large quantities of it. It is a good idea to put a hot water boiler alongside this machine if you require lots of water for tea. One other useful feature is the inclusion of an internal cup dispenser. This gives you the option to either use your own cup or have the machine dispense a 7 or 9oz plastic or paper cup. Other options available are a coin mechanism and base cabinet. 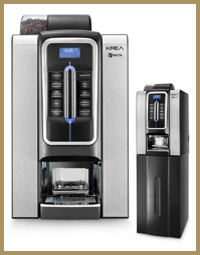 The Krea is cost effective, creates a good quality drink and is easy to use. It is suitable for use as an office coffee machine or in other environments such as hotels, bars and showrooms. Kenco Local Business Service have successfully placed many of these machines across London, Buckinghamshire, Hertfordshire and Berkshire. As with all of our equipment we can offer these machines on either a lease, rental or purchase basis. Indeed we often have refurbished equipment available to us that can be offered on very flexible terms.